Air Canada has a great offer for this spring: it is a cheap flight from Philadelphia to Paris starting from only $1,033 r/t. In case you’ve always wanted to visit Paris or you are traveling for business purpose, don’t miss this offer and make a booking as soon as possible! The flight departs on April 22, 2014 and returns a week later, on April 29, 2014. 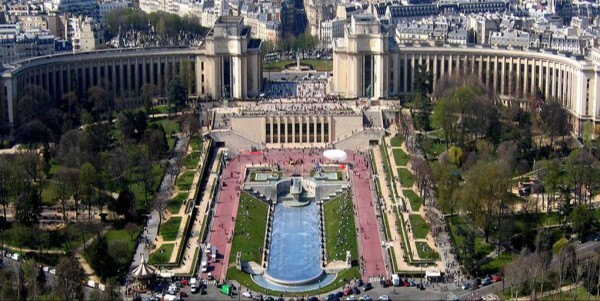 Have a great spring holiday in Paris! In case you want to search for and book this flight, use the box below. I also suggest you to look for other providers’ offers in the box below and compare their prices with this one! You will fly from Philadelphia Pa/wilm`ton International Airport (PHL) to Paris Charles De Gaulle Airport (CDG), departing on April 22, 2014 and returning a week later, on April 29, 2014. Prices on economy class start from only $1,033 r/t. It is a great offer. The flight has two stops, one at Toronto (with a layover of 3 hours 33 minutes) and one at Montreal (with a layover of 3 hours 40 minutes). Thus, the total flight time is 16 hours 40 minutes. 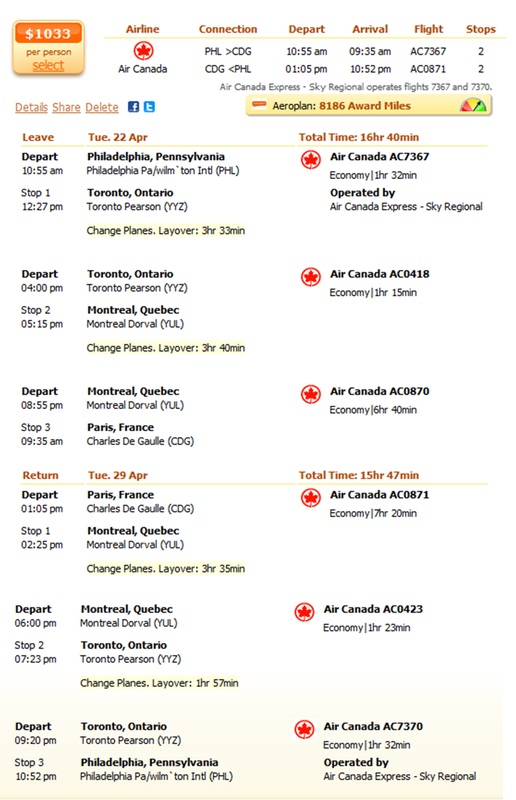 The return flight also has two stops, one at Montreal (with a layover of 3 hours 35 minutes) and one at Toronto (with a layover of 1 hour 57 minutes). The total return flight time is 15 hours 47 minutes. You can check all the details in the screenshot below. The next cheapest airfare is offered by United Airlines. It starts from $1,071 r/t. This is 4% more expensive than our deal. This flight also has two stops, one at Toronto, with a layover of 3 hours 33 minutes and one at Montreal, with a layover of 3 hours 40 minutes. 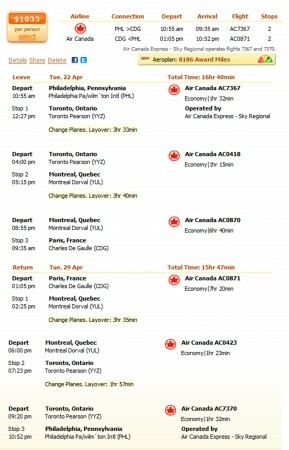 The return flight also has two stops, one at Montreal and one at New Jersey.